The history of robotics has its origins in the ancient world. The modern concept began to be developed with the onset of the Industrial Revolution, which allowed the use of complex mechanics, and the subsequent introduction of electricity. This made it possible to power machines with small compact motors. In the early 20th century, the notion of a humanoid machine was developed. Today, one can envisage human-sized robots with the capacity for near-human thoughts and movement. The first uses of modern robots were in factories as industrial robots – simple fixed machines capable of manufacturing tasks which allowed production with less need for human assistance. Digitally controlled industrial robots and robots using artificial intelligence have been built since the 2000s. Concepts of artificial servants and companions date at least as far back as the ancient legends of Cadmus, who is said to have sown dragon teeth that turned into soldiers and Pygmalion whose statue of Galatea came to life. Many ancient mythologies included artificial people, such as the talking mechanical handmaidens built by the Greek god Hephaestus (Vulcan to the Romans) out of gold, the clay golems of Jewish legend and clay giants of Norse legend. In Greek mythology, Hephaestus created utilitarian three-legged tables that could move about under their own power, and a bronze man, Talos, that defended Crete. Talos was eventually destroyed by Medea who cast a lightning bolt at his single vein of lead. To take the golden fleece Jason was also required to tame two fire-breathing bulls with bronze hooves; and like Cadmus he sowed the teeth of a dragon into soldiers. In ancient Egypt statues of divinities were made of stone, metal or wood. The statues were animated and played a key role in religious ceremonies. They were believed to have a soul (a kꜣ), derived from the divinity they represented. In the New Kingdom of Egypt, from the 16th century BC till the 11th century BC, ancient Egyptians would frequently consult these statues for advice. The statues would reply with a movement of the head. According to Egyptian lore, pharaoh Hatshepsut dispatched her squadron to the "Land of Incense" after consulting with the statue of Amun. The Buddhist scholar Daoxuan (596-667 BC) described humanoid automata crafted from metals that recite sacred texts in a cloister which housed a fabulous clock. The "precious metal-people" weeped when Buddha Shakyamuni died. Humanoid automations also feature in the Epic of King Gesar, a Central Asian cultural hero. Early Chinese lore on the legendary carpenter Lu Ban and the philosopher Mozi described mechanical imitations of animals and demons. The implications of humanoid automations were discussed in Liezi, a compilation of Daoist texts which went on to become a classic. In chapter 5 King Mu of Zhou is on tour of the West and upon asking the craftsman Master Yan "What can you do?" the royal court is presented with an artificial man. The automation was indistinguishable from a human and performed various tricks for the king and his entourage. But the king flew into a rage when apparently the automation started to flirt with the ladies in attendance and threatened the automation with execution. So the craftsman cut the automation open and revealed the inner workings of the artificial man. The king is fascinated and experiments with the functional interdependence of the automation by removing different organlike components. The king marveled "is it then possible for human skill to achieve as much as the Creator?" and confiscated the automation. A similar tale can be found in the near contemporary Indian Buddhist Jataka tales, but here the intricacy of the automation does not match that of Master Yan. Prior to the introduction of Buddhism in the Common Era, Chinese philosophers did not seriously consider the distinction between appearance and reality. The Liezi rebuts Buddhist philosophies and likens human creative powers to that of the Creator. An Elizabethan woodcut of a Brazen Head speaking: "Time is. Time was. Time is past." The Indian Lokapannatti, a collection of cycles and lores produced in the 11th or 12th centuries AD, tells the story of how an army of automated soldiers (bhuta vahana yanta or "Spirit movement machines") were crafted to protect the relics of Buddha in a secret stupa. The plans for making such humanoid automations were stolen from the kingdom of Rome, a generic term for the Greco-Roman-Byzantine culture. According to the Lokapannatti, the Yavanas ("Greek-speakers") used the automations to carry out trade and farming, but also captured and executed criminals. Roman automation makers who left the kingdom were pursued and killed by the automations. According to the Lokapannatti, the emperor Asoka hears the story of the secret stupa and sets out to find it. Following a battle between with the fierce warrior automations, Asoka finds the long-lived engineer who had constructed the automations and is shown how to dismantle and control them. Thus emperor Asoka manages to command a large army of automated warriors. This Indian tale reflects the fear of losing control of artificial beings, which has also been expressed in Greek myths about the dragon-teeth army. Inspired by European Christian legend medieval Europeans devised brazen heads that could answer questions posed to them. Albertus Magnus was supposed to have constructed an entire android which could perform some domestic tasks, but it was destroyed by Albert's student Thomas Aquinas for disturbing his thought. The most famous legend concerned a bronze head devised by Roger Bacon which was destroyed or scrapped after he missed its moment of operation. Automata resembling humans or animals were popular in the imaginary worlds of medieval literature. A diagram of Su Song's book of 1092 showing the inner workings of his clocktower. Mechanical automata were constructed in the 10th century BC in the Western Zhou Dynasty. The artisan Yan Shi made humanoid automata that could sing and dance. The machine is said to have possessed lifelike organs, like bones, muscles and joints. The Cosmic Engine, a 10-metre (33 ft) clock tower built by Su Song in Kaifeng, China, in 1088, featured mechanical mannequins that chimed the hours, ringing gongs or bells among other devices. Fetes of automation continued into the Tang Dynasty. Daifeng Ma built an automated dresser servant for the queen. Ying Wenliang built an automata man that proposed toasts at banquets and a wooden woman automata that played the sheng. Among the best documented automata of ancient China are that of Han Zhile, a Japanese who moved to China in the early 9th century BC. There is only one condition in which we can imagine managers not needing subordinates, and masters not needing slaves. This condition would be that each instrument could do its own work, at the word of command or by intelligent anticipation, like the statues of Daedalus or the tripods made by Hephaestus, of which Homer relates that "Of their own motion they entered the conclave of Gods on Olympus", as if a shuttle should weave of itself, and a plectrum should do its own harp playing. When the Greeks controlled Egypt a succession of engineers who could construct automata established themselves in Alexandria. Starting with the polymath Ctesibius (285-222 BC), Alexandrian engineers left behind texts detailing workable automata powered by hydraulics or steam. Ctesibius built human like automata, often these were used in religious ceremonies and the worship of deities. One of the last great Alexandrian engineers, Hero of Alexandria (10-70 BC) constructed an automata puppet theater, were the figurines and the stage sets moved by mechanical means. He described the construction of such automata in his treatise on pneumatics. Alexandrian engineers constructed automata as reverence for humans' apparent command over nature and as tools for priests, but also started a tradition where automata were constructed for anyone who was wealthy enough and primarily for the entertainment of the rich. The first post-classical society known to construct automata were the Byzantines. They inherented the knowledge on automata from the Alexandrians und developed it further to build water clocks with gear mechanisms, such as for example described by Procopius about 510. The knowledge on how to construct automata was passed on to the Arabs. Harun al-Rashid built water clocks with complicated hydraulic jacks and moving human figures. One such clock was gifted to Charlemagne, King of the Franks, in 807. Arab engineers such as Banu Musa and Al-Jazari published treatise on hydraulics and further advanced the art of water clocks. The segmental gears described in The Book of Knowledge of Ingenious Mechanical Devices, published by Al-Jazari shortly before his death in 1206, appeared 100 years later in the most advanced European clocks. Al-Jazari also published instructions on the construction of humanoid automata. The first water clocks modeled on Arabic designs were constructed in Europe about 1000 CE, possibly on the basis of the information that was transmitted during Muslim-Christian contact in Sicily and Spain. Among the first recorded European water clocks is that of Gerbert of Aurillac, built in 985 CE. Hero's works on automata were translated into Latin amid the 12th century Renaissance. The early 13th-century artist-engineer Villard de Honnecourt sketched plans for several automata. At the end of the 13th century, Robert II, Count of Artois, built a pleasure garden at his castle at Hesdin that incorporated a number of robots, humanoid and animal. Automated bellstrikers, called jacquemart became popular in Europe in the 14th century alongside mechanical clocks. Model of Leonardo's robot with inner workings. Possibly constructed by Leonardo da Vinci around the year 1495. Among the first verifiable automation is a humanoid drawn by Leonardo da Vinci (1452–1519) in around 1495. Leonardo's notebooks, rediscovered in the 1950s, contain detailed drawings of a mechanical knight in armour which was able to sit up, wave its arms and move its head and jaw. In 1533, Johannes Müller von Königsberg created an automaton eagle and fly made of iron; both could fly. John Dee is also known for creating a wooden beetle, capable of flying. The secret interior of The Turk. Tea-serving karakuri, with mechanism, 19th century. Tokyo National Science Museum. The 17th century thinker Rene Descartes believed that animals and humans were biological machines. On his last trip to Norway, he took with him a mechanical doll that looked like his dead daughter Francine. In the 18th century the master toy maker Jaques de Vaucanson built for Louis XV an automated duck with hundreds of moving parts, which could eat and drink. Vaucanson subsequently built humanoid automatons, a drummer and fife player were noted for their anatomical similarity to real human beings. Vaucanson's creation inspired European watchmakers to manufacture mechanical automata and it became fashionable among the European aristocracy to collect sophisticated mechanical devices for entertainment. In 1747 Julien Offray de La Mettrie anonymously published L'homme machine (Man a Machine), in which he called Vaucanson a "new Prometheus" and mused "the human body is a watch, a large watch constructed with such skill and ingenuity". In the 1770s the Swiss Pierre Jaquet-Droz created moving automata that looked like children, which delighted Mary Shelly, who went on to write Frankenstein: The Modern Prometheus. The ultimate attempt at automation was The Turk by Wolfgang von Kempelen, a sophisticated machine that could play chess against a human opponent and toured Europe. When the machine was brought to the new world, it prompted Edgar Allan Poe to pen an essay, in which he concluded that it was impossible for mechanical devices to reason or think. The Japanese craftsman Hisashige Tanaka, known as "Japan's Edison", created an array of extremely complex mechanical toys, some of which could serve tea, fire arrows drawn from a quiver, or even paint a Japanese kanji character. The landmark text Karakuri Zui (Illustrated Machinery) was published in 1796. In 1898 Nikola Tesla demonstrated a prototype remote-controlled submarine at Madison Square Garden as "an automaton which left to itself, will act as through possessed of reason and without any wilful control from the outside." He defended his invention against critical reporters, arguing that his automata was not a "wireless torpedo", but instead, a "mechanical men, which will do the laborious work of the human race." The interior title page of a 1900 The Wonderful Wizard of Oz edition. The robot Maria from the Metropolis (1927 film). Starting in 1900, L. Frank Baum introduced contemporary technology into children's books in the Oz series. In The Wonderful Wizard of Oz (1900) Baum told the story of the cyborg Tin Woodman, a human woodcutter who had his limbs, head and body replaced by a tinsmith after his wicked axe had severed them. In Ozma of Oz (1907) Baum describes the copper clockwork man Tik-Tok, who needs to be continuously wound up and runs down at inopportune moments. In The Patchwork Girl of Oz (1913) a magician's wife stitches together a docile servant, but the Patchwork Girl is given an overdose of cleverness by the magician as substitute for intelligence. In World War I remote control weapons were used, based on the work of Nikola Tesla, who had constructed an electrical boat that could be remotely controlled by radio. The term "robot" was first used in a play published by the Czech Karel Čapek in 1920. R.U.R. (Rossum's Universal Robots) was a satire, robots were manufactured biological beings that performed all unpleasant manual labor. According to Čapek, the word was created by his brother Josef from the Czech robota, meaning servitude. The play R.U.R, replaced the popular use of the word "automaton". However, until the 1950s "robot" was pronounced "robit"[clarification needed] in films, radio and television programs: examples are "The Lonely" episode of the TV series "The Twilight Zone", first aired on 15 November 1959, and the sci-fi radio program "X Minus One". Westinghouse Electric Corporation built Televox in 1926; it was a cardboard cutout connected to various devices which users could turn on and off. In 1927, Fritz Lang's Metropolis was released; the Maschinenmensch ("machine-human"), a gynoid humanoid robot, also called "Parody", "Futura", "Robotrix", or the "Maria impersonator" (played by German actress Brigitte Helm), was the first robot ever to be depicted on film. The most famous Japanese robotic automata was presented to the public in 1927. The Gakutensoku was supposed to have a diplomatic role. Actuated by compressed air, it could write fluidly and raise its eyelids. Many robots were constructed before the dawn of computer-controlled servomechanisms, for the public relations purposes of major firms. These were essentially machines that could perform a few stunts, like the automata of the 18th century. In 1928, one of the first humanoid robots was exhibited at the annual exhibition of the Model Engineers Society in London. Invented by W. H. Richards, the robot - named Eric - consisted of an aluminium suit of armour with eleven electromagnets and one motor powered by a 12-volt power source. The robot could move its hands and head and could be controlled by remote control or voice control. The earliest designs of industrial robots were put into production in the United States. These manipulators had joints modelled on human shoulder-arm-wrist kinetics to replicate human motions like pulling, pushing, pressing and lifting. Motions could be controlled through cam and switch programming. In 1938 Willard V. Pollard filed the first patent application for such an arm, the "Position Controlling Apparatus" with electronic controllers, pneumatic cylinder and motors that powered six axes of motion. But the large drum memory made programming time-consuming and difficult. In 1939, the humanoid robot known as Elektro appeared at the World's Fair. Seven feet tall (2.1 m) and weighing 265 pounds (120 kg), it could walk by voice command, speak about 700 words (using a 78-rpm record player), smoke cigarettes, blow up balloons, and move its head and arms. The body consisted of a steel gear cam and motor skeleton covered by an aluminium skin. In 1939 Konrad Zuse constructed the first programmable electromechanical computer, laying the foundation for the construction of a humanoid machine that is now deemed a robot. The paractical application of binary logic to electric switches had been demonstrated by Claude Shannon, but his calculator was not programmable. In 1941 and 1942, Isaac Asimov formulated the Three Laws of Robotics, and in the process coined the word "robotics". In 1945 Vannevar Bush published As We May Think, an essay that investigated the potential of electronic data processing. He predicted the rise of computers, digital word processors, voice recognition and machine translation. He was later credited by Ted Nelson, the inventor of hypertext. In 1948, Norbert Wiener formulated the principles of cybernetics, the basis of practical robotics. 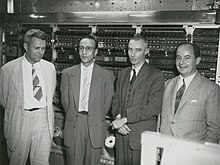 Julian Bigelow at The Princeton Institute for Advanced Study (Left to right: Bigelow, Herman Goldstine, J. Robert Oppenheimer, and John von Neumann). In 1943 Arturo Rosenblueth, Norbert Wiener and Julian Bigelow adopted the human central nervous system as control paradigm for automatic weapons systems. In doing so they pioneered cybernetics (Greek for steersman) and modelled data processing on the assumption that an animal continually communicates its sensorial experience to its central nervous system as automatic and involuntary feedback, thus being able to regulate processes such as respiration, circulation and digestion. Following the Second World War, at a 1946 conference on cybernetics, Warren McCulloch gathered a team of mathematicians, computer engineers, physiologists and psychologists to work on machine operation using biological systems as starting point. Following the publication of his book in 1948, Wiener's idea that inanimate systems could simulate biological and social systems through the use of sensors led to the adaption of cybernetic theories into industrial machines. But servo controllers proofed inadequate in achieving the desired level of automation. The first electronic autonomous robots with complex behavior were created by William Grey Walter of the Burden Neurological Institute at Bristol, England in 1948 and 1949. He wanted to prove that rich connections between a small number of brain cells could give rise to very complex behaviors - essentially that the secret of how the brain worked lay in how it was wired up. His first robots, named Elmer and Elsie, were constructed between 1948 and 1949 and were often described as "tortoises" due to their shape and slow rate of movement. The three-wheeled tortoise robots were capable of phototaxis, by which they could find their way to a recharging station when they ran low on battery power. Walter stressed the importance of using purely analogue electronics to simulate brain processes at a time when his contemporaries such as Alan Turing and John von Neumann were all turning towards a view of mental processes in terms of digital computation. Walter's work inspired subsequent generations of robotics researchers such as Rodney Brooks, Hans Moravec and Mark Tilden. Modern incarnations of Walter's "turtles" may be found in the form of BEAM robotics. The Unimate Pumo 500 and Pumo 560 industrial robots in 1986. In 1951 Walter published the paper A Machine that learns, documenting how his more advanced mechanical robots acted as intelligent agent by demonstrating conditioned reflex learning. The first digitally operated and programmable robot was invented by George Devol in 1954 and was called the Unimate. This later laid the foundations of the modern robotics industry. In Japan robots became popular comic book characters. Robots became cultural icons and the Japanese government was spurred into funding research into robotics. Among the most iconic characters was the Astro Boy, who is taught human feelings such as love, courage and self-doubt. Culturally, robots in Japan became regarded as helpmates to their human counterparts. The introduction of transistors into computers in the mid-1950s reduced their size and increased performance. Therefore computing and programming could be incorporated into a range of applications, including automation. In 1959 researchers of the Massachusetts Institute of Technology (MIT) demonstrated computer-assisted manufacturing. Devol sold the first Unimate to General Motors in 1960, and it was installed in 1961 in a plant in Ewing Township, New Jersey to lift hot pieces of metal from a die casting machine and place them in cooling liquid. "Without any fanfare, the world's first working robot joined the assembly line at the General Motors plant in Ewing Township in the spring of 1961.... It was an automated die-casting mold that dropped red-hot door handles and other such car parts into pools of cooling liquid on a line that moved them along to workers for trimming and buffing." Devol's patent for the first digitally operated programmable robotic arm represents the foundation of the modern robotics industry. The Rancho Arm was developed as a robotic arm to help handicapped patients at the Rancho Los Amigos Hospital in Downey, California; this computer-controlled arm was bought by Stanford University in 1963. In 1967 the first industrial robot was put to productive use in Japan. The Versatran robot had been developed by American Machine and Foundry. A year later a hydraulic robot design by Unimation was put into production by Kawasaki Heavy Industries. Marvin Minsky created the Tentacle Arm in 1968; the arm was computer-controlled and its 12 joints were powered by hydraulics. 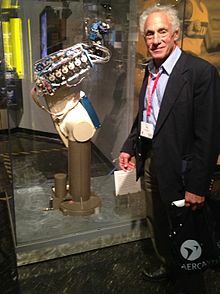 In 1969 Mechanical Engineering student Victor Scheinman created the Stanford Arm, recognized as the first electronic computer-controlled robotic arm (Unimate's instructions were stored on a magnetic drum). In the late-1960s the Vietnam War became the testing ground for automated command technology and sensor networks. In 1966 the McNamara Line was proposed with the aim of requiring virtually no ground forces. This sensor network of seismic and acoustic sensors, photoreconnaissance and sensor-triggered land mines was only partially implemented due to high cost. The first mobile robot capable of reasoning about its surroundings, Shakey, was built in 1970 by the Stanford Research Institute (now SRI International). Shakey combined multiple sensor inputs, including TV cameras, laser rangefinders, and "bump sensors" to navigate. A GBU-10 Paveway II, an American laser-guided bomb, based on the Mk 84 general-purpose bomb, but with laser seeker and wings for guidance. Introduced into service c. 1976. In the early 1970s precision munitions and smart weapons were developed. Weapons became robotic by implementing terminal guidance. At the end of the Vietnam War the first laser-guided bombs were deployed, which could find their target by following a laser beam that was pointed at the target. During the 1972 Operation Linebacker laser-guided bombs proofed effective, but still depended heavily on human operators. Fire-and-forget weapons were also first deployed in the closing Vietnam War, once launched no further attention or action was required from the operator. The development of humanoid robots was advanced considerably by Japanese robotics scientists in the 1970s. Waseda University initiated the WABOT project in 1967, and in 1972 completed the WABOT-1, the world's first full-scale humanoid intelligent robot. Its limb control system allowed it to walk with the lower limbs, and to grip and transport objects with hands, using tactile sensors. Its vision system allowed it to measure distances and directions to objects using external receptors, artificial eyes and ears. And its conversation system allowed it to communicate with a person in Japanese, with an artificial mouth. This made it the first android. Freddy and Freddy II were robots built at the University of Edinburgh School of Informatics by Pat Ambler, Robin Popplestone, Austin Tate, and Donald Mitchie, and were capable of assembling wooden blocks in a period of several hours. German based company KUKA built the world's first industrial robot with six electromechanically driven axes, known as FAMULUS. In 1974, David Silver designed The Silver Arm, which was capable of fine movements replicating human hands. Feedback was provided by touch and pressure sensors and analyzed by a computer. The SCARA, Selective Compliance Assembly Robot Arm, was created in 1978 as an efficient, 4-axis robotic arm. Best used for picking up parts and placing them in another location, the SCARA was introduced to assembly lines in 1981. The Stanford Cart successfully crossed a room full of chairs in 1979. It relied primarily on stereo vision to navigate and determine distances. The Robotics Institute at Carnegie Mellon University was founded in 1979 by Raj Reddy. KUKA IR 160/60 Robots from 1983. Takeo Kanade created the first "direct drive arm" in 1981. The first of its kind, the arm's motors were contained within the robot itself, eliminating long transmissions. In 1984 Wabot-2 was revealed; capable of playing the organ, Wabot-2 had 10 fingers and two feet. Wabot-2 was able to read a score of music and accompany a person. In 1986, Honda began its humanoid research and development program to create robots capable of interacting successfully with humans. A hexapodal robot named Genghis was revealed by MIT in 1989. Genghis was famous for being made quickly and cheaply due to construction methods; Genghis used 4 microprocessors, 22 sensors, and 12 servo motors. Rodney Brooks and Anita M. Flynn published "Fast, Cheap, and Out of Control: A Robot Invasion of The Solar System". The paper advocated creating smaller cheaper robots in greater numbers to increase production time and decrease the difficulty of launching robots into space. In 1994 one of the most successful robot-assisted surgery appliances was cleared by the FDA. The Cyberknife had been invented by John R. Adler and the first system was installed at Stanford University in 1991. This radiosurgery system integrated image-guided surgery with robotic positioning. The Cyberknife is now deployed to treat patients with brain or spine tumors. A x-ray camera tracks displacement and compensates for motion caused by breathing. The biomimetic robot RoboTuna was built by doctoral student David Barrett at the Massachusetts Institute of Technology in 1996 to study how fish swim in water. RoboTuna is designed to swim and to resemble a bluefin tuna[disambiguation needed]. 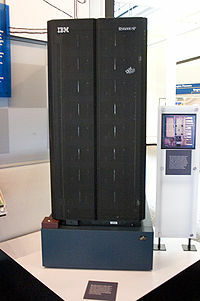 IBM's Deep Blue computer defeated world chess champion Garry Kasparov in 1997. Honda's P2 humanoid robot was first shown in 1996. Standing for "Prototype Model 2", P2 was an integral part of Honda's humanoid development project; over 6 feet (1.8 m) tall, P2 was smaller than its predecessors and appeared to be more human-like in its motions. Expected to operate for only seven days, the Sojourner rover finally shuts down after 83 days of operation in 1997. This small robot (only 23 lbs or 10.5 kg) performed semi-autonomous operations on the surface of Mars as part of the Mars Pathfinder mission; equipped with an obstacle avoidance program, Sojourner was capable of planning and navigating routes to study the surface of the planet. Sojourner's ability to navigate with little data about its environment and nearby surroundings allowed it to react to unplanned events and objects. The P3 humanoid robot was revealed by Honda in 1998 as a part of the company's continuing humanoid project. In 1999, Sony introduced the AIBO, a robotic dog capable of interacting with humans; the first models released in Japan sold out in 20 minutes. Honda revealed the most advanced result of their humanoid project in 2000, named ASIMO. ASIMO can run, walk, communicate with humans, recognise faces, environment, voices and posture, and interact with its environment. Sony also revealed its Sony Dream Robots, small humanoid robots in development for entertainment. In October 2000, the United Nations estimated that there were 742,500 industrial robots in the world, with more than half of them being used in Japan. Roomba vacuum cleaner docked in base station. In April 2001, the Canadarm2 was launched into orbit and attached to the International Space Station. The Canadarm2 is a larger, more capable version of the arm used by the Space Shuttle, and is hailed as "smarter". Also in April, the Unmanned Aerial Vehicle Global Hawk made the first autonomous non-stop flight over the Pacific Ocean from Edwards Air Force Base in California to RAAF Base Edinburgh in Southern Australia. The flight was made in 22 hours. The popular Roomba, a robotic vacuum cleaner, was first released in 2002 by the company iRobot. In 2005, Cornell University revealed a robot capable of self-replication; a set of cubes capable of attaching and detaching, the first robot capable of building copies of itself. Launched in 2003, on January 3 and 24, the Mars rovers Spirit and Opportunity landed on the surface of Mars. Both robots drove many times the distance originally expected, and Opportunity was still operating as of mid-2018 although communications were subsequently lost due to a major dust storm. Self-driving cars had made their appearance by around 2005, but there was room for improvement. None of the 15 devices competing in the DARPA Grand Challenge (2004) successfully completed the course; in fact no robot successfully navigated more than 5% of the 150-mile (240 km) off-road course, leaving the $1 million prize unclaimed. In 2005, Honda revealed a new version of its ASIMO robot, updated with new behaviors and capabilities. In 2006, Cornell University revealed its "Starfish" robot, a four-legged robot capable of self modeling[clarification needed] and learning to walk after having been damaged. 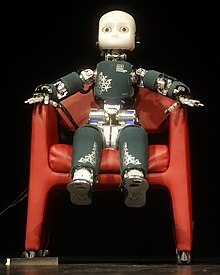 In 2007, TOMY launched the entertainment robot, i-sobot, a humanoid bipedal robot that can walk like a human and performs kicks and punches and also some entertaining tricks and special actions under "Special Action Mode". iCub, humanoid robot built by the Italian Institute of Technology. Robonaut 2, the latest generation of the astronaut helpers, was launched to the space station aboard Space Shuttle Discovery on the STS-133 mission in 2011. It is the first humanoid robot in space, and although its primary job for now is teaching engineers how dextrous robots behave in space; the hope is that through upgrades and advancements, it could one day venture outside the station to help spacewalkers make repairs or additions to the station or perform scientific work. On 25 October 2017 at the Future Investment Summit in Riyadh, a robot called Sophia and referred to with female pronouns was granted Saudi Arabian citizenship, becoming the first robot ever to have a nationality. This has attracted controversy, as it is not obvious whether this implies that Sophia can vote or marry, or whether a deliberate system shutdown can be considered murder; as well, it is controversial considering how few rights are given to Saudi human women. Commercial and industrial robots are now in widespread use performing jobs more cheaply or with greater accuracy and reliability than humans. They are also employed for tasks which are too dirty, dangerous or dull to be suitable for humans. Robots are widely used in manufacturing, assembly and packing, transport, Earth and space exploration, surgery, weaponry, laboratory research, and mass production of consumer and industrial goods. In 2019, engineers at the University of Pennsylvania created millions of nanorobots in just a few weeks using technology borrowed from semiconductors. These microscopic robots, small enough to be hypodermically injected into the human body and controlled wirelessly, could one day deliver medications and perform surgeries, revolutionizing medicine and health. With recent[when?] advances in computer hardware and data management software, artificial representations of humans are also becoming widespread. Examples include OpenMRS and EMRBots. ^ Deborah Levine Gera (2003). Ancient Greek Ideas on Speech, Language, and Civilization. ISBN 978-0-19-925616-7. Retrieved 31 December 2007. ^ a b c William Godwin (1876). "Lives of the Necromancers". ^ Gaston Maspero (2009). Manual of Egyptian Archaeology: A Guide to the Studies of Antiquities in Egypt. BoD. p. 108. ISBN 9783861950967. ^ Strong 2007, p. 133-134. ^ Haug, "Walewein as a postclassical literary experiment", pp. 23–4; Roman van Walewein, ed. G.A. van Es, De Jeeste van Walewein en het Schaakbord van Penninc en Pieter Vostaert (Zwolle, 1957): 877 ff and 3526 ff. ^ See also P. Sullivan, "Medieval Automata: The 'Chambre de beautés' in Benoît's Roman de Troie." Romance Studies 6 (1985): 1–20. ^ "Su Song's Clock: 1088". Retrieved 26 August 2007. ^ "Earliest Clocks". A Walk Through Time. NIST Physics Laboratory. Archived from the original on 31 May 2008. Retrieved 11 August 2008. ^ Currie, Adam (1999). "The History of Robotics". Archived from the original on 18 July 2006. Retrieved 10 September 2007. ^ Kevin LaGrandeur (2013). Androids and Intelligent Networks in Early Modern Literature and Culture: Artificial Slaves. Routledge. p. 24. ISBN 9780415631211. ^ Kevin LaGrandeur (2013). Androids and Intelligent Networks in Early Modern Literature and Culture: Artificial Slaves. Routledge. p. 29. ISBN 9780415631211. ^ Kevin LaGrandeur (2013). Androids and Intelligent Networks in Early Modern Literature and Culture: Artificial Slaves. Routledge. p. 30. ISBN 9780415631211. ^ Kevin LaGrandeur (2013). Androids and Intelligent Networks in Early Modern Literature and Culture: Artificial Slaves. Routledge. p. 31. ISBN 9780415631211. ^ a b Kevin LaGrandeur (2013). Androids and Intelligent Networks in Early Modern Literature and Culture: Artificial Slaves. Routledge. p. 33. ISBN 9780415631211. ^ Truitt, Elly R. "The Garden of Earthly Delights: Mahaut of Artois and the Automata at Hesdin". Iowa Research Online, University of Iowa. Retrieved 22 June 2018. ^ "The da Vinci robot". J. Endourol. 20 (12): 986–90. December 2006. doi:10.1089/end.2006.20.986. PMID 17206888. ... the date of the design and possible construction of this robot was 1495 ... Beginning in the 1950s, investigators at the University of California began to ponder the significance of some of Leonardo's markings on what appeared to be technical drawings ... 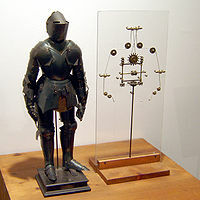 It is now known that da Vinci's robot would have had the outer appearance of a Germanic knight. ^ A Brief History of Robotics, MegaGiant Robotics, 2005. ^ a b "Sir Richard Arkwright (1732–1792)". BBC. Retrieved 18 March 2008. ^ Armand Mattelart (1996). The Invention of Communication. University of Minnesota Press. p. 23. ISBN 9780816626977. ^ T. N. Hornyak (2006). Loving the Machine: The Art and Science of Japanese Robots. Kodansha International. ^ Lisa Nocks (2006). The Robot: The Life Story of a Technology. Greenwood Publishing Group. p. 55. ISBN 9780313331688. ^ Alex Goody (2011). Technology, Literature and Culture: Themes in twentieth and twenty-first century literature and culture. Polity. p. 136. ISBN 9780745639543. ^ Alex Goody (2011). Technology, Literature and Culture: Themes in twentieth and twenty-first century literature and culture. Polity. p. 163. ISBN 9780745639543. ^ a b Armin Krishnan (2016). Killer Robots: Legality and Ethicality of Autonomous Weapons. Routledge. p. 15. ISBN 9781317109129. ^ "R.U.R. (Rossum's Universal Robots)". Archived from the original on 26 August 2007. Retrieved 26 August 2007. ^ Asimov, Isaac; Frenkel, Karen (1985). Robots: Machines in Man’s Image. New York: Harmony Books. p. 13. ^ "The checkered history of automation". newatlas.com. Retrieved 28 January 2019. ^ "MegaGiantRobotics". Retrieved 26 August 2007. ^ "AH Reffell & Eric Robot (1928)". ^ Lisa Nocks (2006). The Robot: The Life Story of a Technology. Greenwood Publishing Group. p. 59-60. ISBN 9780313331688. ^ "Robot Dreams : The Strange Tale Of A Man's Quest To Rebuild His Mechanical Childhood Friend". The Cleveland Free Times. Archived from the original on 21 November 2008. Retrieved 25 September 2008. ^ Scott Schaut (2006). Robots of Westinghouse: 1924-Today. Mansfield Memorial Museum. ISBN 0-9785844-1-4. ^ "Japan's first-ever robot". Yomiuri.co.jp. Retrieved 8 February 2014. ^ Lisa Nocks (2006). The Robot: The Life Story of a Technology. Greenwood Publishing Group. p. 63. ISBN 9780313331688. ^ Lisa Nocks (2006). The Robot: The Life Story of a Technology. Greenwood Publishing Group. p. 60. ISBN 9780313331688. ^ Lisa Nocks (2006). The Robot: The Life Story of a Technology. Greenwood Publishing Group. p. 61. ISBN 9780313331688. ^ Owen Holland. "The Grey Walter Online Archive". Archived from the original on 9 October 2008. Retrieved 25 September 2008. ^ Waurzyniak, Patrick (July 2006). "Masters of Manufacturing: Joseph F. Engelberger". Society of Manufacturing Engineers. 137 (1). Archived from the original on 9 November 2011. Retrieved 25 September 2008. ^ Lisa Nocks (2006). The Robot: The Life Story of a Technology. Greenwood Publishing Group. p. 64. ISBN 9780313331688. ^ Lisa Nocks (2006). The Robot: The Life Story of a Technology. Greenwood Publishing Group. p. 65. ISBN 9780313331688. ^ "Robot Hall of Fame – Unimate". Carnegie Mellon University. Archived from the original on 26 September 2011. Retrieved 28 August 2008. ^ Mickle, Paul. "1961: A peep into the automated future", The Trentonian. Accessed August 11, 2011. ^ "National Inventor's Hall of Fame 2011 Inductee". Invent Now. Retrieved 18 March 2011. ^ a b c d e f "Computer History Museum – Timeline of Computer History". Retrieved 30 August 2007. ^ Armin Krishnan (2016). Killer Robots: Legality and Ethicality of Autonomous Weapons. Routledge. p. 19. ISBN 9781317109129. ^ a b Armin Krishnan (2016). Killer Robots: Legality and Ethicality of Autonomous Weapons. Routledge. p. 20. ISBN 9781317109129. ^ "Historical Android Projects". androidworld.com. ^ "Edinburgh Freddy Robot". Retrieved 31 August 2007. ^ "first industrial robot with six electromechanically driven axes KUKA's FAMULUS". Retrieved 17 May 2008. ^ "The Robot Hall of Fame : AIBO". Archived from the original on 6 September 2007. Retrieved 31 August 2007. ^ "Robotics Institute: About the Robotics Institute". Archived from the original on 9 May 2008. Retrieved 1 September 2007. ^ "Takeo Kanade Collection: Envisioning Robotics: Direct Drive Robotic Arms". Retrieved 31 August 2007. ^ "Genghis, a six legged autonomous walking robot". Retrieved 1 September 2007. ^ "Fast, Cheap, and Out of Control: A Robot Invasion of The Solar System" (PDF). Retrieved 1 September 2007. ^ Habib, Maki K. (2014). Handbook of Research on Advancements in Robotics and Mechatronics. IGI Global. p. 253. ISBN 9781466673885. ^ "Something's Fishy about this Robot". Retrieved 1 September 2007. ^ "ASIMO". Honda Worldwide. Retrieved 20 July 2010. ^ "The Robot Hall of Fame : Mars Pathfinder Sojourner Rover". Archived from the original on 7 October 2007. Retrieved 1 September 2007. ^ "The Honda Humanoid Robots". Archived from the original on 11 September 2007. Retrieved 10 September 2007. ^ "AIBOaddict! About". Archived from the original on 12 October 2007. Retrieved 10 September 2007. ^ "ASIMO". Honda Worldwide – Technology. Archived from the original on 30 September 2007. Retrieved 10 September 2007. ^ Williams, Martyn (21 November 2000). "Technology – Sony unveils prototype humanoid robot – November 22, 2000". CNN. Archived from the original on 12 October 2007. Retrieved 12 September 2007. ^ "NASA – Canadarm2 and the Mobile Servicing System". Retrieved 12 September 2007. ^ "Global Hawk Flies Unmanned Across Pacific". Retrieved 12 September 2007. ^ "Maid to Order". Time. 14 September 2002. Archived from the original on 13 August 2007. Retrieved 15 September 2007. ^ "Cornell CCSL: Self replication". Retrieved 12 September 2007. ^ "Mars Opportunity Rover Mission: Status Reports". Retrieved 31 August 2018. ^ "Robots fail to complete Grand Challenge – Mar 14, 2004". CNN. 6 May 2004. Retrieved 12 September 2007. ^ "Cornell CCSL: Robotics Self Modeling". Retrieved 15 September 2007. ^ "Robonaut | NASA". Nasa.gov. 9 December 2013. Retrieved 8 February 2014. ^ "Saudi Arabia bestows citizenship on a robot named Sophia". TechCrunch. 26 October 2017. Retrieved 27 October 2016. ^ "Saudi Arabia takes terrifying step to the future by granting a robot citizenship". AV Club. 26 October 2017. Retrieved 28 October 2017. ^ "Saudi Arabia criticized for giving female robot citizenship, while it restricts women's rights - ABC News". Abcnews.go.com. Retrieved 28 October 2017. ^ "About us". Archived from the original on 9 January 2014. ^ Carne, Nick (8 March 2019). "Researchers make a million tiny robots". Cosmos Magazine. Retrieved 8 March 2019. Haug, Walter. "The Roman van Walewein as a postclassical literary experiment." In Originality and Tradition in the Middle Dutch Roman van Walewein, ed. B. Besamusca and E. Kooper. Cambridge, 1999. 17–28. Baumgartner, Emmanuèlle. "Le temps des automates." In Le Nombre du temps, en hommage à Paul Zumthor. Paris: Champion, 1988. pp. 15–21. Brett, G. "The Automata in the Byzantine 'Throne of Solomon'." Speculum 29 (1954): 477–87. Glaser, Horst Albert and Rossbach, Sabine: The Artificial Human, Frankfurt/M., Bern, New York 2011 "The Artificial Human. A Tragical History", ebook "The Artificial Humans. A Real History of Robots, Androids, Replicants, Cyborgs, Clones and all the rest"
Sullivan, P. "Medieval Automata: The 'Chambre de beautés' in Benoît's Roman de Troie." Romance Studies 6 (1985). pp. 1–20. History of Robots in 10 Minutes. This page was last edited on 18 April 2019, at 09:27 (UTC).